You will be redirected to the new address in five seconds. If you see this message for more than 5 seconds, please click on the link above! Schematic drawing of bacterial conjugation. Conjugation diagram1- Donor cell produces pilus. 2- Pilus attaches to recipient cell and brings the two cells together. 3- The mobile plasmid is nicked and a single strand of DNA is then transferred to the recipient cell. 4- Both cells synthesize a complementary strand to produce a double stranded circular plasmid and also reproduce pili; both cells are now viable donors. gene transfer as are transformation and transduction although these two other mechanisms do not involve cell-to-cell contact. Bacterial conjugation is often incorrectly regarded as the bacterial equivalent of sexual reproduction or mating since it involves the exchange of genetic material. During conjugation the donor cell provides a conjugative or mobilizable genetic element that is most often a plasmid or transposon. Most conjugative plasmids have systems ensuring that the recipient cell does not already contain a similar element. The genetic information transferred is often beneficial to the recipient. Benefits may include antibiotic resistance, xenobiotic tolerance or the ability to use new metabolites. Such beneficial plasmids may be considered bacterial endosymbionts. Other elements, however, may be viewed as bacterial parasites and conjugation as a mechanism evolved by them to allow for their spread. The prototypical conjugative plasmid is the F-plasmid, or F-factor. The F-plasmid is an episome (a plasmid that can integrate itself into the bacterial chromosome by homologous recombination) with a length of about 100 kb. It carries its own origin of replication, the oriV, and an origin of transfer, or oriT. There can only be one copy of the F-plasmid in a given bacterium, either free or integrated, and bacterium that possess a copy are called F-positive or F-plus (denoted F+). Cells that lack F plasmids are called F-negative or F-minus (F-) and as such can function as recipient cells. Among other genetic information the F-plasmid carries a tra and trb locus, which together are about 33 kb long and consist of about 40 genes. The tra locus includes the pilin gene and regulatory genes, which together form pili on the cell surface. The locus also includes the genes for the proteins that attach themselves to the surface of F- bacteria and initiate conjugation. Though there is some debate on the exact mechanism of conjugation it seems that the pili are not the structures through which DNA exchange occurs. This has been shown in experiments where the pilus are allowed to make contact, but then are denatured with SDS and yet DNA transformation still proceeds. Several proteins coded for in the tra or trb locus seem to open a channel between the bacteria and it is thought that the traD enzyme, located at the base of the pilus, initiates membrane fusion. When conjugation is initiated by a signal the relaxase enzyme creates a nick in one of the strands of the conjugative plasmid at the oriT. Relaxase may work alone or in a complex of over a dozen proteins known collectively as a relaxosome. In the F-plasmid system the relaxase enzyme is called TraI and the relaxosome consists of TraI, TraY, TraM and the integrated host factor IHF. The nicked strand, or T-strand, is then unwound from the unbroken strand and transferred to the recipient cell in a 5'-terminus to 3'-terminus direction. 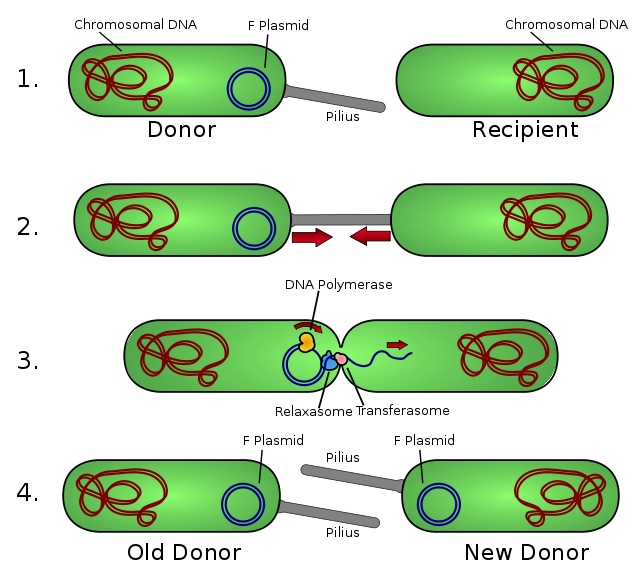 The remaining strand is replicated either independent of conjugative action (vegetative replication beginning at the oriV) or in concert with conjugation (conjugative replication similar to the rolling circle replication of lambda phage). Conjugative replication may require a second nick before successful transfer can occur. A recent report claims to have inhibited conjugation with chemicals that mimic an intermediate step of this second nicking event. If the F-plasmid that is transferred has previously been integrated into the donor’s genome some of the donor’s chromosomal DNA may also be transferred with the plasmid DNA. The amount of chromosomal DNA that is transferred depends on how long the two conjugating bacteria remain in contact. In common laboratory strains of E. coli the transfer of the entire bacterial chromosome takes about 100 minutes. The transferred DNA can then be integrated into the recipient genome via homologous recombination. A cell culture that contains in its population cells with non-integrated F-plasmids usually also contains a few cells that have accidentally integrated their plasmids. It is these cells that are responsible for the low-frequency chromosomal gene transfers that occur in such cultures. Some strains of bacteria with an integrated F-plasmid can be isolated and grown in pure culture. Because such strains transfer chromosomal genes very efficiently they are called Hfr (high frequency of recombination). The E. coli genome was originally mapped by interrupted mating experiments in which various Hfr cells in the process of conjugation were sheared from recipients after less than 100 minutes (initially using a Waring blender). The genes that were transferred were then investigated. The nitrogen fixing Rhizobia are an interesting case of inter-kingdom conjugation. For example, the tumor-inducing (Ti) plasmid of Agrobacterium and the root-tumor inducing (Ri) plasmid of A. rhizogenes contain genes that are capable of transferring to plant cells. The expression of these genes effectively transforms the plant cells into opine-producing factories. Opines are used by the bacteria as sources of nitrogen and energy. Infected cells form crown gall or root tumors, respectively. The Ti and Ri plasmids are thus endosymbionts of the bacteria, which are in turn endosymbionts (or parasites) of the infected plant. The Ti and Ri plasmids can also be transferred between bacteria using a system (the tra, or transfer, operon) that is different and independent of the system used for inter-kingdom transfer (the vir, or virulence, operon). Such transfers create virulent strains from previously avirulent strains. Conjugation is a convenient means for transferring genetic material to a variety of targets. In laboratories successful transfers have been reported from bacteria to yeast, plants, mammalian cells and isolated mammalian mitochondria. Conjugation has advantages over other forms of genetic transfer including minimal disruption of the target's cellular envelope and the ability to transfer relatively large amounts of genetic material (see the above discussion of E. coli chromosome transfer). In plant engineering, Agrobacterium-like conjugation complements other standard vehicles such as tobacco mosaic virus (TMV). While TMV is capable of infecting many plant families these are primarily herbaceous dicots. Agrobacterium-like conjugation is also primarily used for dicots, but monocot recipients are not uncommon.